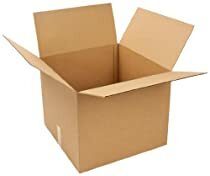 The Pratt PRA0361 recycled corrugated cardboard double wall heavy-duty box is made of 100 percent recycled, 48 ECT grade corrugated fiberboard with standard kraft color in a square shape for packing, shipping, and storing. The box has a 48 edge crush test (ECT) value for heavy-duty stacking performance, and is made of double wall corrugated fiberboard (one C flute, one B flute) for extra protection of box contents. ECT grade corrugated cardboard is constructed, tested, and graded for compressive strength, which is a useful quality for stacking; ECT values are measured in pounds per inch, and range between 23 and 112. 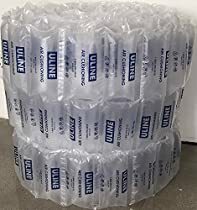 This regular slotted container (RSC) is shipped knocked down flat (KDF) to reduce shipping costs and storage space, and can be assembled by taping the bottom flaps. When assembled, the box measures 20 x 20 x 16 inches (L x W x H). (L is length, the horizontal distance on the longest side; W is width, the horizontal distance on the shortest side; H is height, the vertical distance from top to bottom). Excellent quality for heave objects.Would definitely purchase again and encourage someone to purchase. Sturdy and perfect for shipping across country! I manufacture, sell, and ship a 3d printer. This box is excellent and puts up with rough handling. It is the perfect size for the printer with about 1.5 inch extra on all sides for packing. I fill pack with styrofoam peanuts. The box is strongly made and bonded well at the seam. It came in a 10 pack for a GREAT price.